"Empowering and moving, this book strokes, bumps, prods, and cajoles the reader toward the flower bud within that yearns to blossom. Even with all of its pains, life is a chosen joy when it is lived on purpose, and this book shows you how to do it." "Your Life on Purpose is a remarkable little book. I don't think anyone has ever made as much sense out of the conflicts embedded in the human condition in as few words. The idea that pain and fear are necessary experiences if we are to build lives we care about is a surprisingly freeing notion. Then the question becomes, what do we care most about? This book helps us answer this question for ourselves--and turn intentions into action, step by careful step. Reading this book, I thought of 10 friends and family members who need to read it, too." "Your Life on Purpose is a rock solid manual for self-realization through acceptance, for self-guidance through surrender, and mastering the delicate, critical balance between control and limitation in daily life. Vital reading for therapists and their patients, rigorously researched, clinically fascinating." "Proposing to tackle the purpose of life might appear a sure-fire recipe for obtuse philosophizing or airy generalizations. Not here. 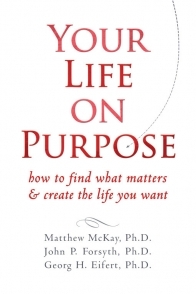 The authors of `Your life on Purpose' manage the feat of walking their readers toward giving their own concrete, practical and, above all, meaningful answers to these age-old questions. The language is simple and direct, the tone gentle and friendly, the style lively and unpretentious. Though based on the solid scientific foundations of the new Acceptance and Commitment Therapy approach, this is not a therapy book. The book invites you on a voyage of rediscovery of your life values. Along the way, you will learn to navigate potential values conflict and to identify which of three kinds of barriers -- thoughts, emotions or perfectible skills -- might hold you back. Gentle and evocative exercises will help you overcome those obstacles and get moving. I particularly liked the exercises that let you experience what living life in accordance to your most deeply held values might feel and look like -- a profoundly motivating experience.Here is a deeply human and readily doable step-by-step approach to living your life on purpose. It's a book for anyone who wants to live in closer harmony with their values."